Hello! I must firstly thank everyone for the lovely messages/wishes for My Boy :) He had a wonderful birthday and now we have the excitement of the end of term (more parties!) which will be followed by a trip to Wales at the weekend. It's non-stop! I've improvised the 'pattern' and as it's small, I've been able to pick it up here and there during the last few very busy days. Just one and a half sleeves to go and it'll be done, so I should have a Finished Object for Friday! I'm not really loving the way the colours have turned out on the bottom half - it reminds me of an untuned analogue TV - but it's a quick project that should be useful for her while we're away as the weather has turned quite cool this week, so it's a "doofer". I actually really like the way the yarn is pooling - not something I'd wear myself but so cute for a little miss ;) Those wound yarn cakes look so inviting too! I think it's an adult thing that we don't like the pooling. The Blues I did for my son last week did it as well, and he loves it! Maybe it's our need to have more order. I love the colours and am all for quick projects. I love this tunic, its so cheerful! The yarn is great! I've only just knitted my first cardy, so I can't yet imagine just being able to knit something up without a pattern. Is the yarn Patons Smoothie DK? I've tried to knit with it and found it extremely difficult to cast on as it's so splitty, once I get going it's better, but have you any tips to make it easier to knit with? Beautiful tunic!! I love the colors! Can't wait to see what you do with the Studio Dazzle - it looks like lovely colorways! Wow, I love that sweater so far! Your yarn looks fabulous just sitting there. It will be awesome! OMG, i love that yarn you just balled. It's beautiful!!!! I love the sweater top. WOW you made that fast! I think the buttons will look great with those colors. Cute lil' garment and oh gosh, those buttons! Love the colorways of the wound up yarn. Very cute little top! And you're right, it does look like analog TV static! Very cute top! And the yarn, can''t wait to have a closer look! You just started Friday?! You've made quick progress! It's cute. I've been looking for diversions from the YOP, too. I like the way it pooled at the bottom. 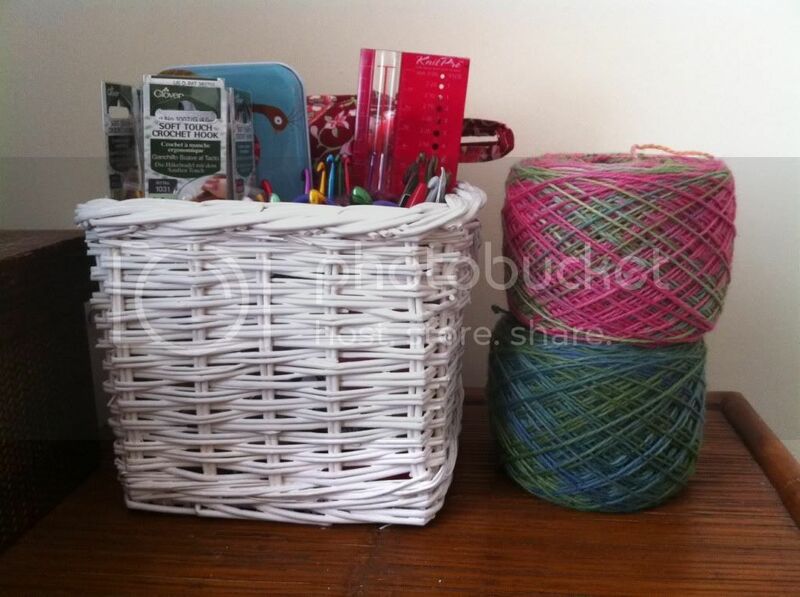 Those two cakes of yarn are just gorgeous! Love the yarn!! Great job!! What a sweet little tunic! That tunic is completely brilliant! 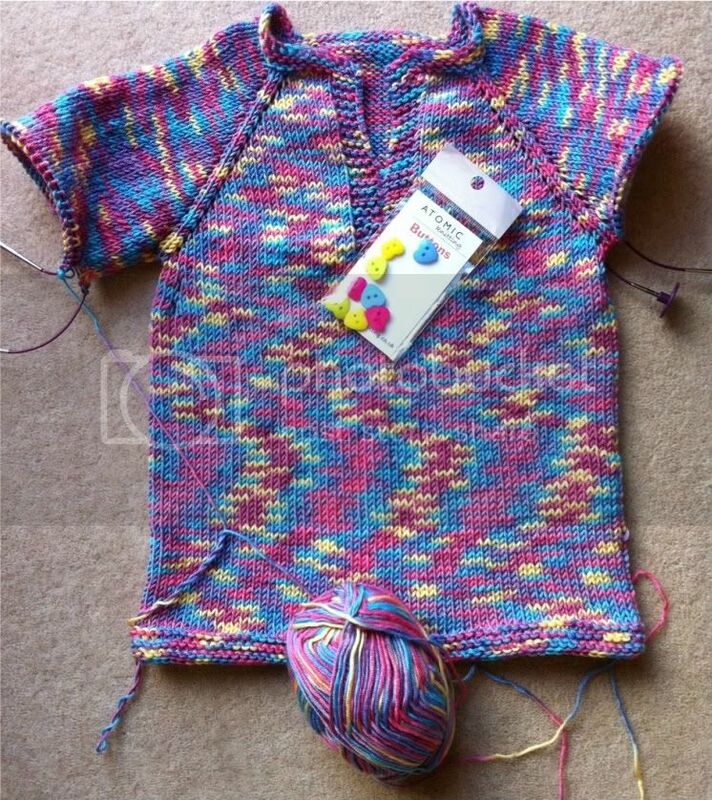 I love the pattern itself, and the yarn is working up like a summer daydream, and the buttons are going to look great. I want one of my own!